Reo Stevens tutorial on busting a strapless air. Everything must have a beginning. And the beginning of strapless freestyle tricks starts with the straight air; it’s the start of all other tricks. Having the ability, and being able to recognise when the board is secure to your feet without straps, is essential to progressing your strapless abilities. Right click and open in new tab to see high resolution. 1) Like any jump, whether it’s strapped or strapless, to leave the water you must load up the kite and board by setting a rail and edging against the kite. This creates added tension in the lines that you’ll use to lift you off the water. 2) As you load up your board, turn its nose slightly into the wind, just enough so as you leave the water, the bottom of the board is facing into the wind. You may point your toes to help if you feel necessary. 3) Throughout the air, ensure you keep the bottom of the board facing into the wind; if the upwind rail goes low enough for the wind to hit the top of the board, the board will fly off your feet. 4) Spot your landing and land like you would a normal strapped jump. 1) Take you back hand off the bar – it’s then easier to rotate your body to a position that allows you to get the bottom of the board up and facing the wind. 2) Use the chicken loop to speed up or slow down and to stay connected with your board in the air. 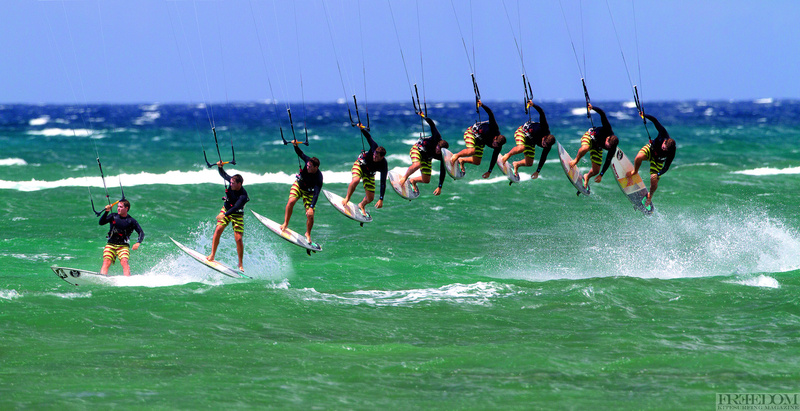 3) If possible, time your take off with a ‘kicker’ such as a small wave or chop to help you initiate your jump.